everything the festive season has to offer and an additional egg nog or two. A really great gift for a loved one is to book them an appointment with one of our style consultants to discuss a custom-made garment you’d like HKT to make for them. If the recipient of your gift has never had a bespoke piece of clothing made for them in the past, this is sure to be a luxurious treat they’ll remember for a long time. We can meticulously create made-to-measure suits, shirts, pants, blazers and vests for men and women, and from an extensive range of world-leading fabrics. This means the custom-made item they receive will feel absolutely amazing to wear and truly flatter their personal style and physique. The only problem is that once a partner, parent or other loved one starts to wear one of our bespoke garments, they might start requesting the same gift for future holiday celebrations or birthdays. You have been warned! To book an appointment with one of our style consultants, please call us on 770-458-8682, email service@hktclothiers.com, or use our online booking form. Another special present you could give a loved one is an HKT gift card. This will allow them to buy a stylish garment or accessory they really want and will stop you having to trawl the internet or walk around all the stores to find the perfect piece of clothing for Uncle Bob, Aunt Jean, or Cousin Gregory. Online you can order HKT gift cards that range from $50 to $500 in value. Visit hktclothiers.com/product/hkt-gift-cards to find out more. Alternatively, give our team a call on 770-458-8682 to specify the exact amount you’d like to gift and we’ll create a bespoke gift card for you. Pajamas have been a great gift idea for a long time. They’re perfect for husbands and wives, mums and dads, grandparents and children. But who in your family can say they own a pair of made-to-measure pajamas that have been lovingly crafted from luxurious fabric and feature their own initials? This is now the wonderful gift you can give someone in your family or a close friend. 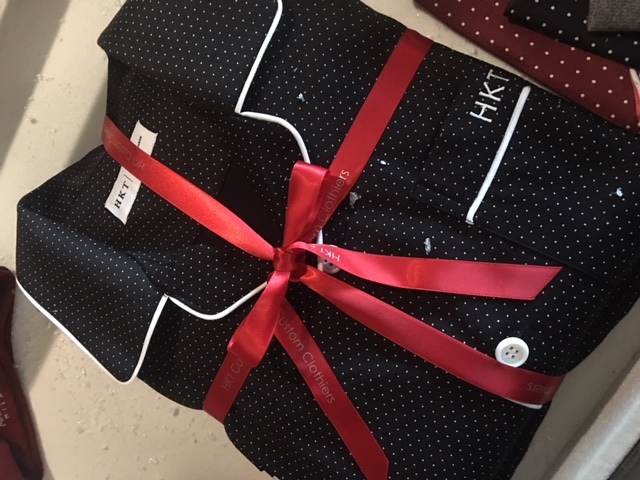 That’s because HKT has recently started to create tailor-made pajamas that fit exquisitely, feel amazing next to the skin, and can be personalized with different colored trims and a monogram of your loved one’s initials. Looking good on the golf course, as well as in the clubhouse, might be extremely important to one of your loved ones or even an esteemed client. If that’s the case, why not give them a special treat with a pair of our tailored golf pants, or have a bespoke golf polo shirt created for them. We cater for men and women and guarantee that our made-to-measure golf polos and pants will fit perfectly, offer an ultimate level of comfort, and look fantastic. The hardest part is choosing from all the high-quality fabrics we stock, as well details such as the color of trims on trouser pockets and the style of a collar on a polo. To find out more, take a look at our blog post on our custom made golf pants and polos. Finding a pair of jeans that fit perfectly and look great usually takes most people a lot of time. That’s because different brands use different standard sizes and cuts. At HKT, we offer a bespoke jeans service which means you can have the ultimate pair of jeans created for a loved one. The recipient of your gift can choose the color and weight of the denim for their jeans, the fit they want, as well as personalize lots of other elements such as pockets, stitching, and belt hoops. As normal, our master tailors will take a series of precise measurements from your loved one’s body to ensure the jeans fully consider all elements of their individual physique. To find out more, take a look at our blog post on our bespoke jeans service. Another gift that’s often given in the holidays is the necktie. But the ties you can buy in most high street stores don’t tend to exude any degree of luxury or make the person who wears them feel particularly special. At HKT, everything’s different. We stock sumptuous Italian silk ties from world-leading brands such DolcePunta and Italo Ferretti. As well as looking incredible, they feel great to touch, hang perfectly, and will last for many years to come. On top of this, our master tailors can create a bespoke bow tie for you if this is something a loved one is more likely to wear. As always, these are crafted with meticulous care, and you can choose from an extensive range of fabrics and colors. So if you’re looking for a premium bow tie (or necktie) in the colors of your dad’s favorite sports team, we just might be able to help. Personalization certainly makes a gift feel extra special. With our range of custom made ladies’ and men’s belts, you can choose the thickness and length of your belt, the color and pattern of the leather, and the finish of the buckle – rose gold, matt silver, shiny silver, or gold. You also have the option to add the name or monogram of a loved one on the inside the belt too. All of this means you can gift a truly unique present that definitely shows its recipient how much you think of them. What’s also particularly great about giving a belt is that it’s something people typically wear a lot (sometimes every day), which means they’ll be constantly reminded about how much thought you put into giving them an extra special gift. 8. Visit the HKT showroom and get inspired! 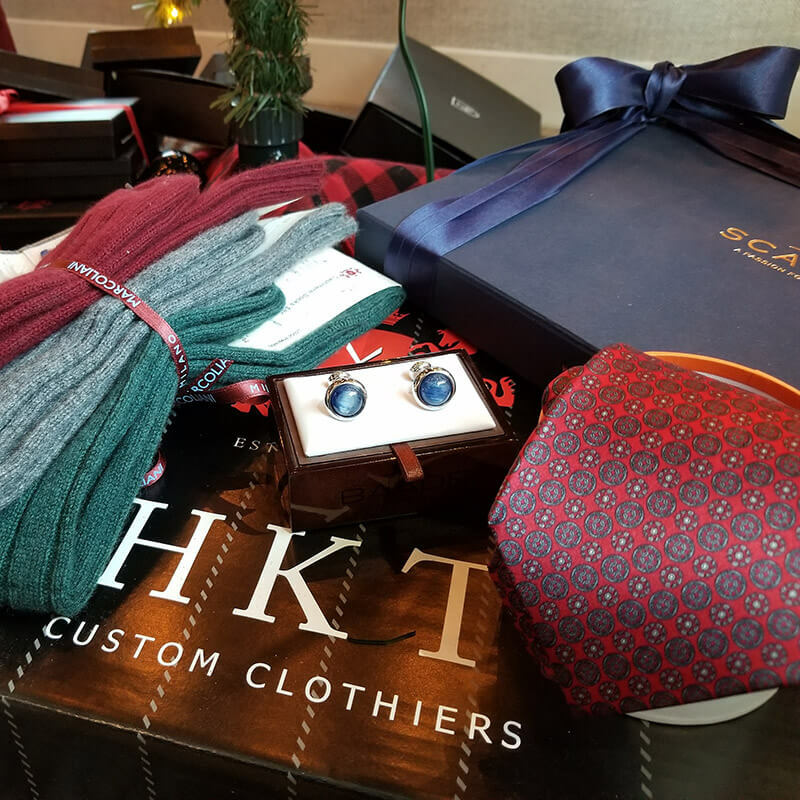 In this blog, we’ve only touched upon some of the amazing presents you could purchase from HKT to give to your loved ones. On top of everything we’ve mentioned, we also stock a carefully selected range of ready-to-wear garments and accessories from some of the world’s most luxurious brands. These include suits, tuxedos, sports jackets, shirts, dress pants, jeans, T-shirts, cufflinks, sunglasses, luxury socks, and so much more. So why not come and visit us at our showroom in Doraville, Atlanta? You can have a chat with one of our friendly style consultants about who you’re buying a gift for, their personal style, and what your budget is. We’ll then be able to talk you through some options and show you lots of superb gift ideas. Alternatively, if you can’t make it to our store, simply give us a call on 770-458-8682. We can then offer you plenty of gift guidance and send you some photos of what might be the ideal present for the person you’re buying for.